Dylan obsessives will happily play who's who. Face Value – heh, who’d have thought to come up with that title for an exhibition of portraits? It’s not particularly clever, but there’s something of the contrarian mischief-maker in it all the same, for in the 50 years that Bob Dylan has been making music, giving interviews and being lionised, there’s never been much danger of anyone taking him at face value. Or at least there shouldn’t be. And the same could be said of the 12 portraits in this exhibition. Who are they? We’re told they’re an amalgam of real people and fictive people, created, Dylan has said, “on the run” – meaning during stolen moments when he’s been on tour. Or perhaps just meaning his paintings are a means of mental escape, and have a largely therapeutic function. 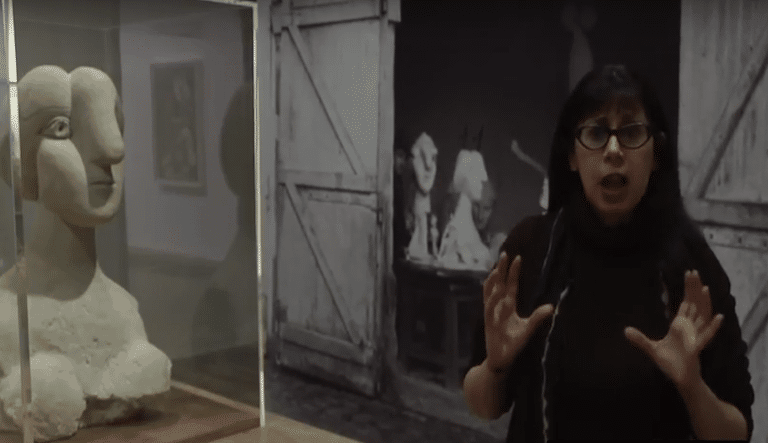 The portraits, all new and created specially for this exhibition, are of people he’s met, or at least known about, as well as those who’ve spilled forth from his imagination, with a cross-over, apparently between all three. Each has a name, above which there’s another title: “Slap in the Face”, “On the Face of It”, “Face to Face”, “Face Facts” and so on. I can’t say these Face slogans add anything. You could spend hours trying to guess who some of them might be, and I’m sure Dylan obsessives will: “Skip Sharpe” (pictured) with his dark, heavy-set features, looking like a cross between Fred West and John Berger; “Nina Felix” (pictured), with her cross, close-set eyes and long black hair scribbled in contrary directions; Ursula Belle, with her haunted, Depression-era look – a refugee from a Dorothea Lange photograph. Dylan is giving away nothing – he says in the catalogue interview that one of his subjects is “actually a member of the Sydney Yacht Club” and that they’re just “conventional people”, but folk and blues aficionados will no doubt have a lot of fun. Skip Sharpe is likely to be an amalgam of two of Dylan’s Blues heroes: Skip James and the cap-wearing Blind Willie McTell, about whom Dylan wrote a song (“Blind Willie McTell” recorded in 1983 and to be found on The Bootleg Series Volumes 1-3 – but then, Dylan aficionados will know this, too); and American folk singer Julie Felix looks passably like Nina Felix. I’ll leave the rest to others. 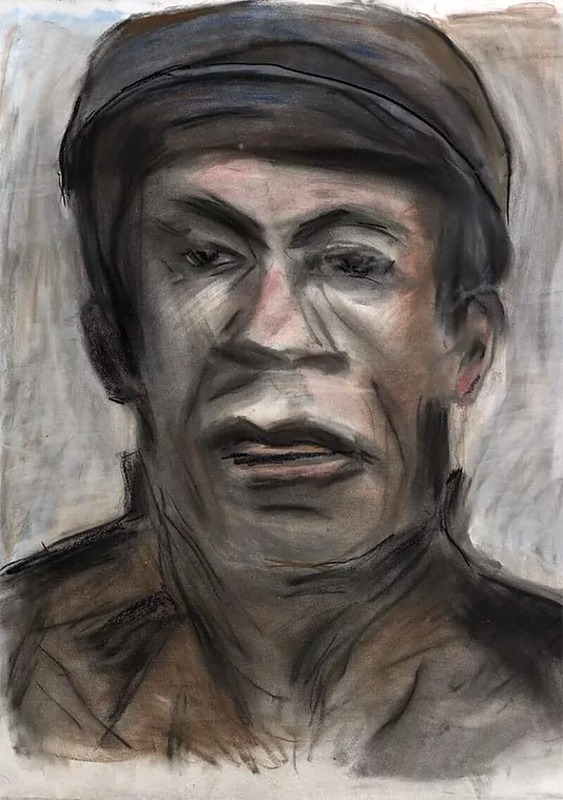 Dylan has been painting and drawing for most of his life and these 12 pastel portraits might be described as naïve – but then, much of what’s produced by contemporary professional artists might also be described as naïve, whether it’s a self-conscious and knowing position or not. For a while naivety in figurative painting became a default setting, coupled with a kind of drippy and fawning faux-sincerity (or sincere sincerity – who can tell?) and perhaps it still is, since portraiture was seen for a long time a redundant form and it seemed the only way to rethink it. Think of Americans Elizabeth Peyton and Karen Kilimnik. Or even the even cruder celeb portraits of British artist Stella Vine. But Dylan’s portraits don’t really fit in to that knowingly cheesy sub-genre of portraiture, though you might argue they’re a masculine version of it: Dylan’s portraits are pared down, almost monochrome, and his subjects stare stoically ahead, those heavy-set Desperate Dan jawlines suggesting Dylan’s limited, identikit range. Indeed, they’re bit like police mugshots, and you might also think of some of the American archetypes that populate the songs of Woody Guthrie and, of course, Dylan’s own musical oeuvre. 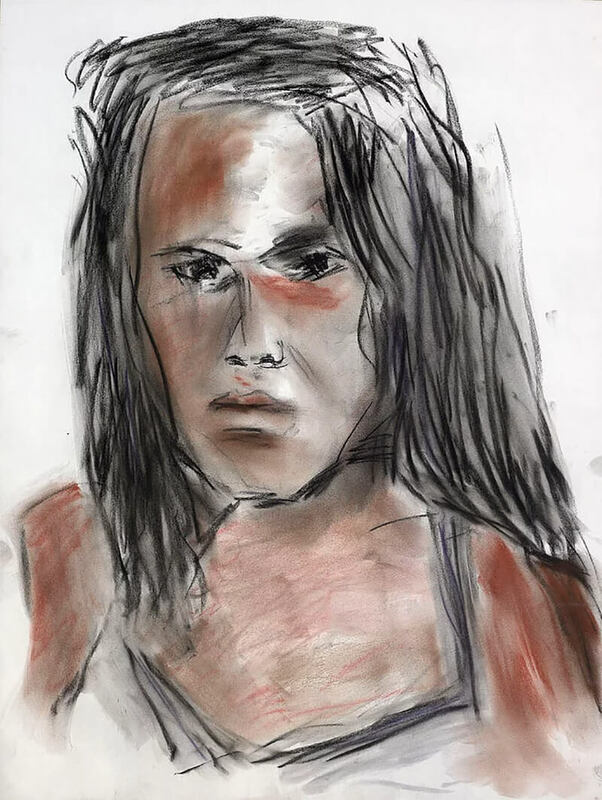 Dylan really isn’t a bad artist – I’ll stick my neck out and say that, occasionally, he’s even quite a good one – though one of the two portraits he’s chosen for publicity purposes, Nina Felix, is certainly the weakest. These portraits are more than competent, but they’re just a little dull. There’s no quickness or liveliness in the mark-making, though a few do stand out – Skip Sharpe, Ursula Belle, Sylvia Renard. These have something, even if that something just shows an accomplished hobbyist. This review first appeared in The Arts Desk on 24 August, 2013.